Now available: Ghosts of Christmas Past! Katy Lindstrom knows December is the best time for ghost hunting–all you really need is some excellent Kona blend and a little patience. But this year brings a ghost of Christmas past she might not be able to catch. All Katy wants is to enjoy the uptick in business and forget that this is the first Christmas without her grandmother. But when one of Springside’s notorious citizens returns–as a ghost–and leaves a dear friend in a coma, Katy will try anything to get Christmas back on track. 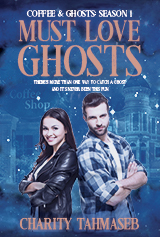 A disastrous ghost eradication leaves her partner Malcolm scalded and both of them out of options. Katy must sort through her feelings for him while fending off the interest of a shady cabal of necromancers. And if she can’t catch that elusive ghost of Christmas past? It may end up ruining everyone’s future. Curious? Missed out on Season One? Check out the episode list or jump straight to the bundle. The episodes and the bundle are available to read for free in Kindle Unlimited, or if you’re buying, grab the bundle and save 30%. The series bundle is also available in print.